Most of the people invest with an aim to protect and grow their savings. They allocate their savings in different proportions across multiple financial instruments to achieve their myriad financial objectives. However, instead of randomly allocating our savings as per one’s investment objectives, it is advisable that people follow standard proven framework to prioritize their investments. In other words, before investing, people should recognize which of their investment objectives should be prioritized over others based on a sound logical and expert backed approach. Investments can be made for a huge variety of needs. One could be saving for one’s retirement which can be a few decades away. Or one could be saving to buy a house in a few years. One could be saving for emergency medical funds which are usually required at a moment’s notice. So how does one classify which of these needs has a higher degree of criticality or importance? In order to do that, experts have proposed a financial framework called “Hierarchy of Investment Needs”. This framework has its roots in the psychological framework called “Maslow’s Hierarchy of Needs” – which was proposed by the famous psychologist Abraham Maslow. Maslow’s hierarchy of needs, in its simplest of forms takes a pyramidal shape highlighting the importance of needs. Simply put, this pyramid shows that some human needs are to be taken care of before the others. 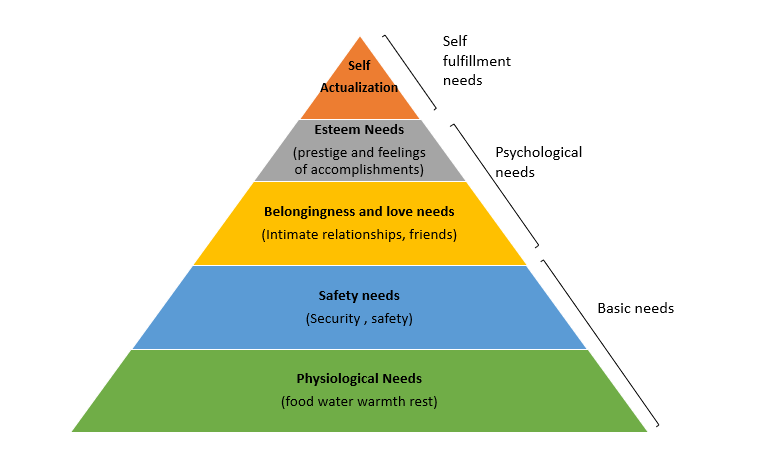 It shows that human beings only deal with their higher needs (which are shown higher in the pyramid) after the simpler ones are satisfied (the lower ones in the pyramid). On similar lines, for investors the “Hierarchy of investment needs” framework classifies which investment needs /objectives should ideally be prioritized over others. This represents the money which one might need to handle a personal emergency. Since such instances are unforeseen, these funds should be available at a very short notice when needed. Ideally they should be available partly as physical cash and partly as funds which can be immediately be withdrawn from a bank. With the advent of online banking and ATMs, it has become relatively easy to bank upon the fast accessibility of these funds. Accidents and disasters can happen anytime. If one isn’t adequately insured, it might lead to a financial ruin which can eat away all the hard earned money. It’s thus advisable to calculate a realistic amount that will allow your dependents to finance at least short and medium-term life goals if you were to drop dead or be struck with a debilitating injury or disease. Medical and term insurance both are very much needed before one thinks about savings. Short term investment goals which are two to three years away need to be taken care of after insurance. Such investments should have minimal risk and easy liquidity. Savings, liquid funds and deposits account for such investments. These are the goals which are 5 to 6 years away (medium term) and 10-20 (years) away. These investments should ideally be backed by equity or equity oriented funds. This would provide the investor the possibility to extract maximum gains from one’s investment over a long period of time. The hierarchy of investment needs framework gives a structural approach for one to allocate one’s savings. However, one can think of many such levels depending on one’s personal circumstances. So this pyramidal framework should be treated only as a guiding map instead of a rigid classification. The system is meant to make you invest first for the lower level goals before letting you move to a higher level goal. If you have not set aside money for contingency purpose, you should not buy insurance. 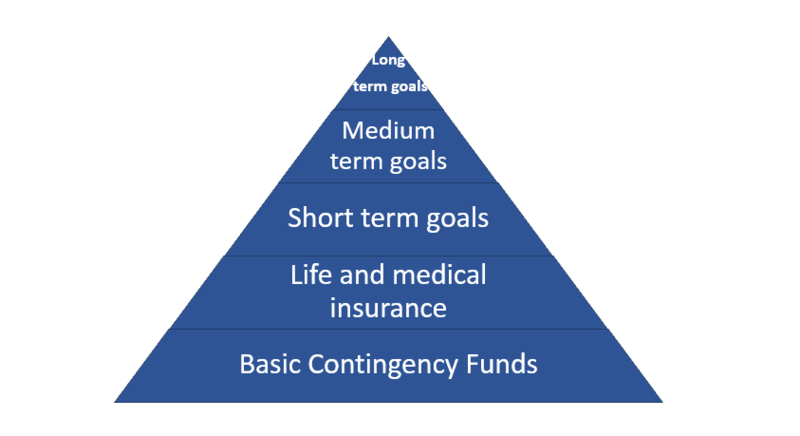 Unless you buy medical and term insurance, you should not save for short or medium term goals. Following this should take care of the following important financial aspects which ideally provide an investor some peace of mind.